As you all know I have quite an addiction for scented candles. I use them all season, no matter what! In this post I will show you the ones I used up in the last few months. Come ormai saprete ho una certa fissazione per le candele profumate. Le uso in tutte le stagioni, che sia caldo o freddo! In questo post, vi mostrero' quelle che ho utilızzato ultimamente. Moschino ...Oh!De Moschino Eau de Toilette Yes, yes, yes, I know, this is not a candle, but talking about fragrances I decided to include this perfume that I've recently used up. I got this Moschino perfume trillions of years ago when I was working as event hostess for an Italian drugstore chain. Let me say this straight: I quite hated it. It was really not my cup of tea and this is why I've just used it as room refresher. The main top notes should have been flowery with a more woody and powdery heart and bottom notes. I could really not smell any flower notes, to me it smelled just strongly artificial, really similar to some plain dish soap. I've just noted that this product's long been discontinued- very good for that! Si, si, si lo so, questo non e' affatto una candela, ma visto che parliamo di fragranze, ho deciso di includere in questo post anche questo profumo che ho finito recentemente. Ho ricevuto questa eau de toilette di Moschino circa trilioni di anni fa quando lavorai come hostess per eventi per una catena di drogherie del nord-est d'Italia. Vi dico subito una cosa: l'ho odiato. Non era davvero nelle mie corde e per questo l'ho utilizzato principalmente come profumatore d'ambiente. Le noti di testa avrebbero dovuto essere floreali con un cuore legnoso e di talco. Personalmente, non ho sentito alcuna nota floreale, ma aveva un forte odore artificiale che mi ricordava molto il detersivo per piatti XD. Se non sbaglio questo profumo e' andato fuori produzione-cosa che non mi rattrista per niente! 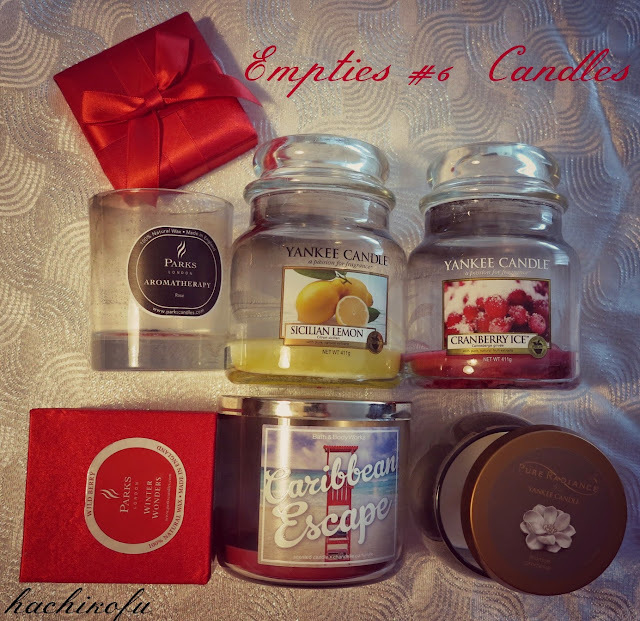 rating: 1/5 Do you like scented candles? Or do you find them too expensive for your taste? Let me know your opinion in the comments below! A voi piacciono le candele profumate? O le trovate troppo care? Fatemi sapere la vostra opinione nei commenti sottostanti! Ciao Belle!! !